Damian and I both grew up in southern California, which means that our entire pasts are peppered with memories of Disneyland. The overwhelming elation of the very first visit. Then over the years, birthday parties and family adventures. High school senior ditch day! The Magical Kingdom has always been this amazing, ubiquitous part of the southern California childhood experience. And of course, for us, that meant we couldn’t wait to take Waits for the first time. But we wanted to make sure he would be old enough to really “get” it . . . and also tall enough to ride the good rides! 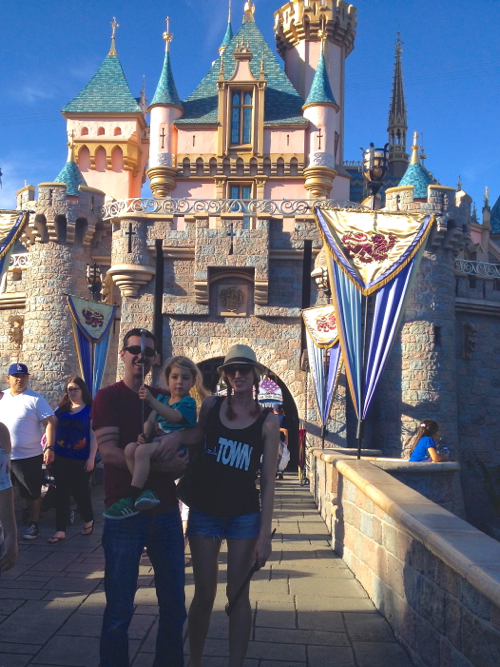 So we decided, together, that his fourth birthday present would be a trip to Disneyland. Finally! 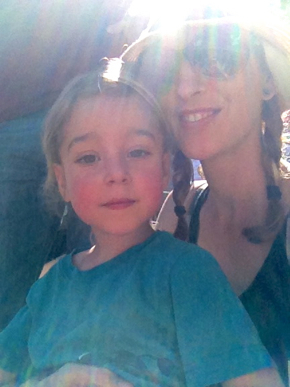 Left: Waiting in line for The Haunted Mansion, lookit those rosy cheeks. Mid-morning and it was already over 80º! 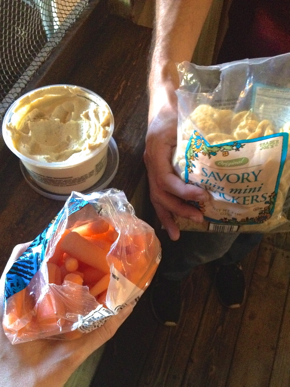 // Right: Healthy snacking in line for the Jungle Cruise. 2) They are all pure carb, very little protein. Which doesn’t work for us. So that’s fine, we don’t need to eat off of Mickey’s menu. Luckily the park is awesome about allowing people to bring their own food in, so that’s just what we did. And oh my gosh, it saved us some major money as well! Like I said, we brought our own food (thank you Trader Joe’s!) which I carried in a knapsack. It was cheap and easy and I recommend it times a million. Left: Virtual reality flight-testing the Iron Man suit. BEST! Right: The only things we bought were drinks and “treats” – like this frozen lemonade that the three of us shared. Because dudes, it was really hot. Another snack attack on a park bench in Toon Town. We ate before we arrived, brought two tubs of hummus, rice crackers, carrot sticks, and Lara Bars, and then stopped for a late dinner on the way home. I recommend this. 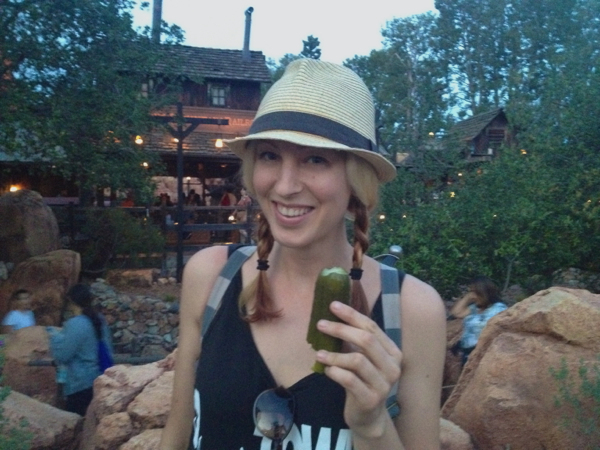 No trip to Disneyland could be complete without a giant pickle. WHY ARE THESE SO GOOD?! It was such an amazing day, and so nice to spend the time together as a family. When Damian and I first separated, we told Waits, “We’re still a family. We look different now, but we’re still a family.” And I’m proud of us for that. 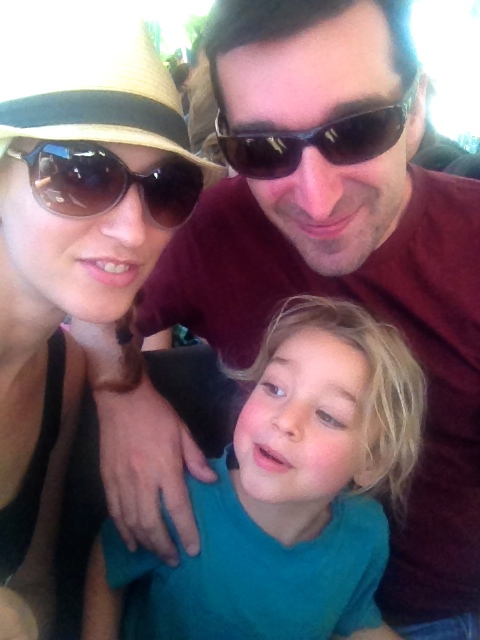 I’m so grateful for this eccentric, unconventional, absolutely perfect little family of mine. I wouldn’t have it any other way. That night at dusk we were traversing the park, and we stumbled across the Main Street Parade. Floats and singing and dancing, such a spectacle. Damian lifted the kid up onto his shoulders, and Waits just watched, eyes so wide with wonder. He doesn’t know many of the Disney characters, but he does have a bit of a penchant for one particular blue blazered duck. Tears were instantly in my eyes and I had to fight back that stupid lump in my throat. His joy was just so completely unabashed, so utterly innocence. He believed with all of his heart that that was really Donald Duck up there. He believed it so sincerely. And that single precious moment was the highlight of the whole entire trip, for me. OMG I love Disneyland! 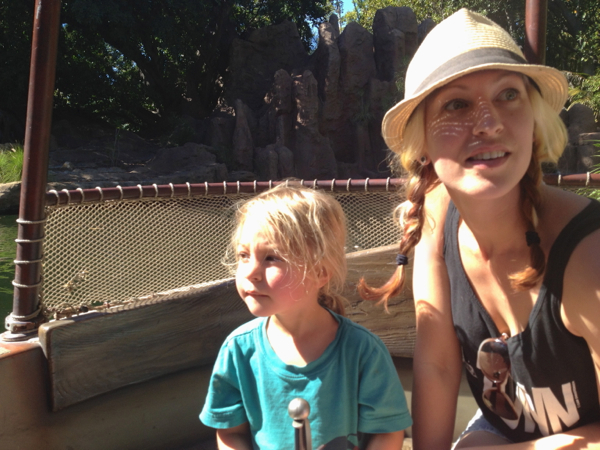 I’m so glad that you and your family had a great time… especially little Waits! What a wonderful birthday present! I remember when I was about his age, my character hat of choice was Daisy’s :) Ducks are the best! And I didn’t know that Disney allows visitors to bring their own food. I am definitely packing up snacks next time! I’ve got a little tear in my eye now too! So glad you all had a wonderful time. Disneyland is pretty special :D I’m in England so I’ve been to the Paris one a few times and Florida once but never LA. I want to though! Happy Birthday Waits!!! Sounds like it was an amazing day! I love his rosy cheeks. Happy birthday, Waits!! This is such an awesome post. I’m a new reader, and I love your stories and writing. This sounds like a wonderful trip. So cool. I got teary at at the description of Waits seeing Donald. Happy Birthday Waits!! I love this! I love to see your family getting together for special events like this. What a lovely, healthy way to handle your separation. Waits is very lucky! Also, I am thrilled to see another family that cares about social issues nonetheless embrace Disney! My husband and I love Disney, we grew up with it (we’re over in Florida though!) and we couldn’t wait to take our kids. Like Waits, my son didn’t know all the characters either, but it doesn’t matter, we still had such a fun day. We look at the Disney stories with a critical eye, but can still enjoy the magic and nostalgia :) And we go with food packed, too. Thanks so much for sharing and always being so positive! Love your blog. That’s great that they let you bring in food. I always thought they were more vigilant about it. Did they check your bag? He is super prone to flushing, it’s adorable. Thanks Monika! Aw, thanks Tamara. And welcome to the site! Hi Sam, thanks for this comment. I was definitely a little nervous about posting this, and wondered if people would find it at odds with the rest of my lifestyle. So, thanks for the support. I think there’s a way to enjoy something while still being critical of it. Conversation is key. What a great story. I really admire your ability to maintain a platonic relationship and allow Waits to see his parents functioning together. If I may ask, as I am also a part of a blended family and it has been very difficult feeling on the outside of the biological parental unit at times, how do you and your new partner cope with that? Do you ever consider having him also be a part of your family trips and events, so that Waits sees his new family inclusive to new partners/step parents? Hi Brina! Yup, they check the bags for weapons and drugs or whatever it is they’re looking for, haha. They don’t mind the food at all, which I think is really cool of them. It makes things SO much easier. Damian and Jeremy have also hung out on their own, just the two of them, getting to know each other. So far the whole experience has been amazing. We make it up as we go along, but we’re all good people with good intentions, so that makes it easier to find our way. Happy birthday, Waits! There are so many things to love about this post: 1) the loving and cooperative way you and Damian have decided to co-parent Waits despite your separation; 2) that you guys love Disney as much as my family does; and 3) a preview of what’s in store for us when we take our now 3.5-year-old daughter for her 5th birthday. Did Waits ever get scared of the characters or the rides? Fun!! I’ve never been to Disneyland, but I’ve done Disney World as a vegetarian (wasn’t vegan then). We brought most of our own food too….mostly bc we were broke college students. I remember eating a can of spaghetti-o’s (cold out of the can) in the park! Ha. Growing up in Orlando, my dad was one of the electrical engineers at Walt Disney World. 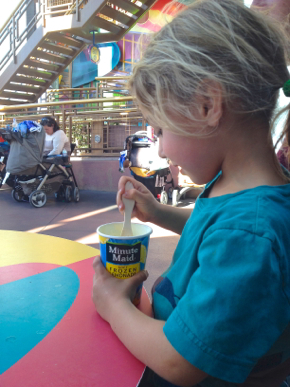 This meant free admission, anytime…and Disney became my babysitter, of sorts. I was dropped of there often to spend the entire day by myself. 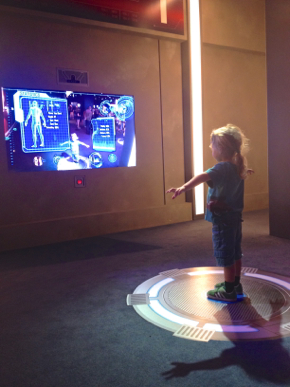 It was easy to forget how excited and important this experience can be to a child (and kids-at-heart!) Reading this entry really just made my day. :-) Thank you for sharing, as always. I totally agree about bringing your own food into the park. It’s much cheaper, and the kinds of things that you’ll bring with you are far and away better taste-wise than anything you’ll find there. We always get a locker for the day for a cooler. (It just has to be soft-sided and smallish.) Plus, it’s nice to slip a couple of sweatshirts in there for when it gets chilly at night. I think it’s so wonderful that you’re still able to maintain a working relationship with Damian and model that for Waits. Plus, it means that neither of you have to feel resentful that you’re missing out on an important moment like a first trip to Disneyland. The way you described Waits seeing Donald put a lump in my throat too. So sweet. I go to Disneyland so rarely, but I always look forward to the vegan gumbo in a sourdough bowl. It’s certainly not health food, though! 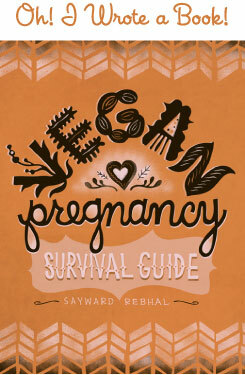 I love this well-researched list that The Vegan Cowgirl put together. I’ll be sure to use it next time I go! Your commitment to being a family no matter what form it takes is beautiful and inspiring. I know Waits benefits from the mutual respect and love that you share with Damian and from seeing you in a healthy, loving relationship with Jeremy.